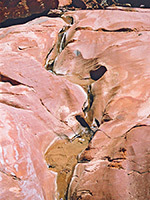 Starlight Canyon is a west side tributary of the upper Paria River, located about 8 miles north of highway 89 in the far south of Utah. 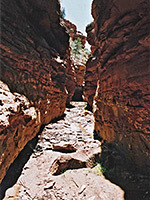 The canyon is only a few miles long, quite deep and mostly rather wide but is notable for a short, pretty slot section where the canyon has eroded through the Wingate sandstone layer to form a cool, enclosed passageway through deep red rocks, with pour-offs and smooth water-carved channels. The narrows are enlivened by a clear stream that flows year round, over a few small waterfalls and cascades, and a visit here is an easy day hike into a completely unspoilt region. The area also has various other canyons to explore, and also contains pictographs, historic sites and colorful rock formations. The route starts at the end of the track to the old Pareah townsite, which leaves US 89 at mile 31. During dry conditions all vehicles can be driven 6 miles right to the end, and parked somewhere on the mud flats beside the Paria River, though if wet 2WD cars may have to be left at the carpark by the Paria movie set. 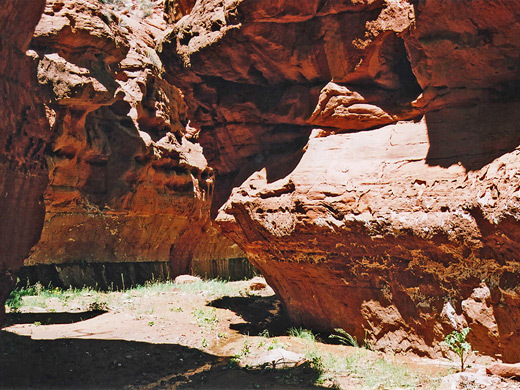 The hike may not be possible at all just after heavy rain as the approach road is often impassable, since it crosses clayish soils of the Chinle formation. There are plenty of camping places around the end of the track, though the official campsite that used to be at the movie set is now closed. 11 views of Starlight Canyon. TopoQuest topographic map of Starlight Canyon - the narrows are southwest of '34'. 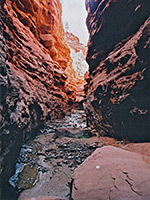 The first objective is to walk up the Paria River valley for 4.5 miles to the junction with Kitchen Creek on the left; the narrows of Starlight Canyon are a further 1.5 miles upstream along Kitchen Canyon. The main valley is little changing along the way, a half mile wide corridor of mud flats and pebble deposits with scattered patches of bushes and reeds, in the middle of which (for most of the year) flows the muddy water of the Paria, generally just a few inches deep. The sloping valley sides are made of highly colored, stripy layers of the Chinle formation, with vertical red cliffs of Moenave sandstone above. The river needs to be crossed several times, as it flows round a few wide bends then enters a long straight section, passing two pairs of unnamed side canyons, later becoming more overgrown, wooded and a little narrower approaching the Kitchen Creek tributary. 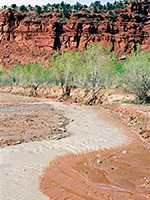 This too has a permanent stream flowing down, its waters red-brown in color, quite different to the usually light brown clayish water of the Paria. Kitchen has a narrower, more entrenched canyon and hiking is easiest right in the sandy streambed. Starlight Canyon joins from the west after about 20 minutes walking while the main drainage soon reaches 40 foot Kitchen Falls, where the creek tumbles over a cliff onto a mass of boulders, a blockage which may be passed if desired by walking up a steep slope on the right hand side. Starlight Canyon soon becomes narrow and quite enclosed, the surrounding cliffs now higher and more vertical. 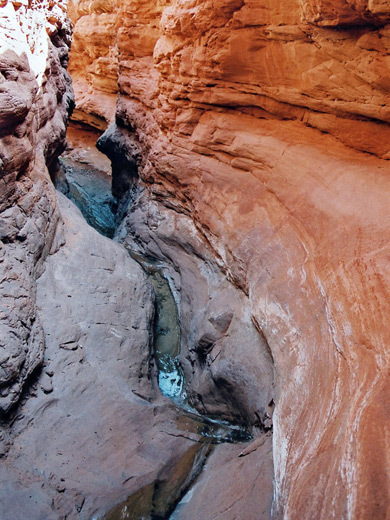 The narrows begin with a wide curve leading into a straight, dark section and ends in several upward steps through cascades and shallow pools, then beyond, as before, is quite an open ravine bordered by thin ledgy strata that continues for several more miles and becomes gradually shallower. Starlight is a pleasant enough canyon, not really that special, but the clear stream running through the slot section makes it more interesting. The hike to here from the end of the Paria road takes about 5 hours round trip.